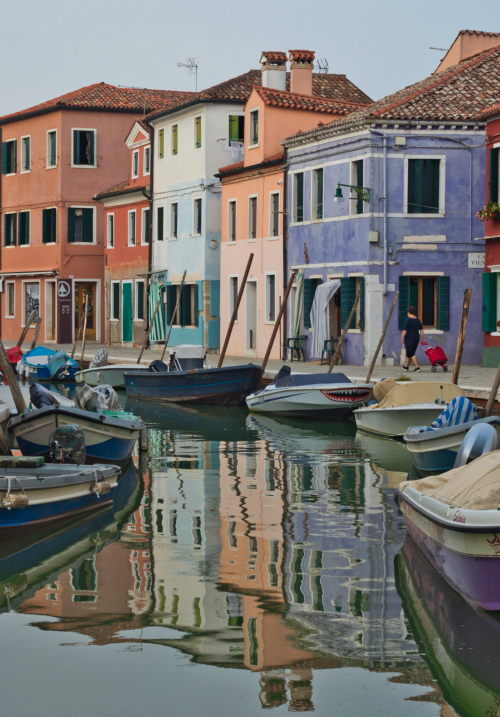 The vibrant houses of Burano, Italy are a photographer’s dream come true. Just four miles off the coast of Venice, Italy stands the technicolor island of Burano. Originally painted in rich, rainbow hues to help local fisherman spot the town through fog, its polychromatic walls now attract approximately 60,000 visitors each year. I’m profoundly grateful that this September my sojourns brought me there. When I decided to take the leap to travel for three months over the summer, I wasn’t sure what I’d find or even exactly what I was looking for despite countless hours of planning. Before embarking, I knew that I wanted to 1) pursue my burgeoning passion for photography and 2) revolt against the script that long-term travel was only for the retired. Courtany poses in front of one of the many waterways that wind throughout and connect Burano. Despite having several destinations planned for my trip through Europe, Burano ended up on my itinerary at the last minute and very much so by coincidence. A two-day layover in Venice–the result of me waiting until two weeks before takeoff to book my flight–turned into double jeopardy when I saw pictures of Burano on Instagram posted by a friend I had met just days prior in Croatia. After arriving past midnight to my Venetian hostel, I woke the next morning to two travelers in my room, one of whom was going to Burano that day. That’s life. It’ll throw you curveballs and, from my experience, the best thing to do is swing. With an area of 52 acres and a high elevation of just 1 meter, Burano’s entirety is easily covered in a day; but by the last boat back to Venice I hardly felt ready to leave. I felt at home among the multicolored walls, as the bright buildings brought me back to my childhood. As a kid, each year of elementary school began with a trip to the store for school supplies, and each year my most favorite purchase was Crayola’s 96 box of crayons. Going to Burano felt like going back to a simpler and happier time in my life when I was allowed to color outside of the lines and encouraged to enter a colorful world of pretend and creativity on my path to self-discovery. A yellow bird soaks in the sunrays. This summer, city after city, what I discovered most was myself–the many everchanging, bold layers of me. Day after day, being behind the camera gave me boundless joy because with each click of the shutter I affirmed to myself that my point-of-view was important. Above all, taking this trip communicated to myself that the person I will always need to spend the most time trying to hear is myself. It has been said that eyes are the windows into the soul. For me, through photography and travel, my eyes have given me a window into my own soul. A local walks home past reflections of Burano in the water. Burano showed me that sometimes the best place to find myself is in a place I have never been…although being in Burano was a bit like walking into a dreamy déjà vu. Now, I have vivid memories of the beautiful, prism-like town, and will always be thankful to know that a few thousand miles away there are people living on a rainbow-colored island, throwing their windows open with abandon to all of life and its mystery. The shutters of this pink building invite the imagination, painting an idyllic image of one of Italy’s most colorful towns.